It took nearly a full year for the Viktoria tunnel boring machine to see the light of day again. 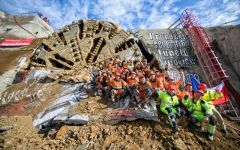 Pilsen-Doubravka, October 7, 2017 – The boring of the 4,150-meter long northern half of the Ejpovice Tunnel has been completed, as the Viktoria tunnel boring machine re-emerged near Pilsen's borough of Doubravka earlier today. Amid much public interest, Viktoria's cutter head made its way through the exit portal during a bore-through ceremony organized on this occasion. The event was attended by Minister of Transport Dan Ťok, officials from the Railway Infrastructure Administration, the State Fund for Transport Infrastructure, the contractors – Metrostav and Subterra, other partners and guests. Apart from improving passenger safety and comfort, one of the objectives of modernizing the rail line that connects the Czech capital and Pilsen, where the section between the latter and Rokycany is an important part, is reducing the travel time to less than one hour. Currently, a train trip between the two cities takes one hour and 35 minutes. "The completion of the Ejpovice Tunnel will shorten the distance that trains have to travel between Prague and Pilsen. Today's bore-through ceremony, which marks the completion of the second half of the tunnel, brings us closer to the day when the travel time between these two important Czech cities will be reduced by more than 30 minutes. Traveling by train is very attractive in today's hectic society, because it allows people to rest or, conversely, catch up on their work," said the Railway Infrastructure Administration's CEO Pavel Surý. Manufactured by the Herrenknecht Company in Schwanau, Germany, Viktoria weighs approximately 1,800 tons, is 115 meters long, and features a cutter head with a diameter of almost 10 meters. To protect the environment, the heaviest parts of the machine were transported to the Czech Republic by ship. Tunnel-boring machines (TBM) are currently one of the most widely used tunnel construction technologies. Their main advantages include speed and safety. Previously, boring the southern half of the tunnel took four months longer. The second time around, Metrostav's engineers were familiar with the local conditions and were able to make appropriate preparations. Despite that, the geological makeup in some areas was significantly different from what the workers encountered during the first project stage. "Boring through the northern tunnel is a historical event for several reasons. It marks the completion of drilling work on the longest rail tunnel in the Czech Republic. The project has been executed using a tunnel boring machine with a cutter head featuring the largest diameter ever used in this country. In addition, we achieved the longest daily advance of 38 meters. Conversely, the other reasons why this project is exceptional are not as optimistic. It is because the end of this project marks the beginning of a period in which no large-profile tunnels will be bored in the Czech Republic, which is a situation unheard of during the last 50 years. A glance into both the distant and recent past shows that as many as 22 projects have been executed in the Czech Republic since the year 2000. They included tunnels for roads, highways, railways and subways. In 2005, for instance, Czech construction workers were working simultaneously on eight underground ventures of this kind. However, we are now entering a period during which neither Metrostav nor any other domestic company will have work for its boring specialists, and we must seek ways of putting to use the highly qualified teams that have undergone costly training. Although we do our best to find contracts abroad, they will not provide enough opportunities for using all the capacity that we have at our disposal. Considering the progress of preparations, other tunnel boring projects will be executed no sooner than many months or, more likely, several years from now. All Czech construction companies would appreciate it if transport infrastructure projects were planned faster," explained Metrostav's CEO Pavel Pilát. Viktoria is a convertible machine, which means that it can function in several modes that allow it to bore through both soft soil and solid rock. The machine creates a completely finished tunnel with walls built from concrete rings composed of seven plus one segments. The rings are reinforced with steel and polypropylene fibers. Each ring is two meters wide and 40 centimeters thick. The rings were made in Dýšina, approximately two kilometers from the construction site. More than two thousand rings were necessary for each of the tunnels. At present, eight safety passageways are being bored between the southern and northern tunnels. Those located in hard spilite rock are drilled using the New Austrian Tunneling Method (NRTM), which employs explosives. As a result, Pilsen's inhabitants can appreciate the fact that the two tunnels have been bored using the TBM technology, because relying on the originally considered NRTM method would have caused high noise levels.